I was not at all aware about Swedish cooking before I got a request for a private Swedish cooking class last November. It looked like no chances to make for me. However at the end of the story the class went well and I became attached to many Scandinavian dishes among which gravlax goes first. Gravlax is home marinated salmon served with special mustard sauce on rye bread toast. It requires hardly any work and is a killer appetizer. For those like me, who can't really stop eating it halfway, it often tends to become a self sufficient lunch or dinner. My first reaction to the request was a rush to Wikipedia. It was saying something about meatballs, cranberry sauce, aquavit, potato cakes and of course marinated salmon. After that I felt somewhat ready to call the client back and ask for details. Despite me saying that I didn't really cook any Swedish they still decided to entrust me with the event. "Oh don't worry..." - they said - "...Russians are in general better aware of Swedish food than the Swedish are." Only later on I found how lucky I was to meet these amazing people I now became good friends with. I spent some good time reading various Swedish food blogs (especially loved the kokblog) and doing testings. I got lucky again and my friend gave me The Scandinavian Cookbook by Trina Hahnemann. I fell in love with the book and got a copy for myself very soon afterwards. Since then I find myself using it more and more when cooking for my family. Coming back, gravlax was one of the dishes on the cooking class menu. Given that the fish takes at least two days to marinate I had to make it in advance. The whole event went well, but I was especially proud of the fact that my Swedish guests really liked that gravlax. This is not however the reason why I started making it at home. That's solely because I love how it tastes. It is incredibly simple to make and the result will feel like three times worth your effort. It is so good and so different from any store bought salted or smoked salmon. It will take you hardly fifteen minutes to prepare the marinade. Then you forget about the fish for two days. Finally, at the happy day you slice the fish, mix the mustard sauce (five minutes), trow both on your fresh rye toast and (as Nigella would say) apply to face. Freeze the salmon for 24 hours and then defrost it. This is to remove the possible harmful bacteria (I repetitively found this suggestion in books and blogs and thought why not). Remove the scales and bones from the fish. Trim the fatty edges of the fillet. Lay the fish skin side down on a large sheet of cling film or in a plastic container. First, cover the fillet with chopped dill. Then combine pepper, coriander, salt and sugar in a small bowl and spread the mixture over the dill. Cut the fillet across into two equal parts. 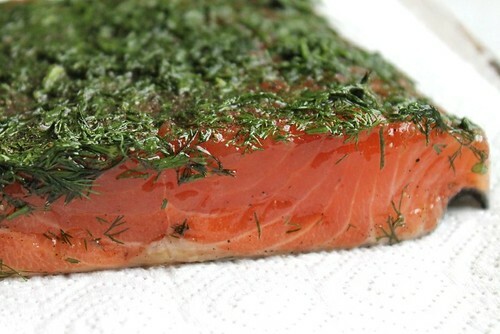 Spread the springs of dill over the first half of the fillet. Cover it with the second half of the fillet (turning it skin side up, fat side of the second half of the fillet to the thin side of the first half of the fillet). Wrap the fish securely in cling film and refrigerate for two days. Once done, unwrap the fish. Clean it from the marinade with a paper towel. Take a sharp knife and slice the fish diagonally as thinly as possible. Combine all ingredients of the mustard sauce in a food processor. Serve the fish on rye bread toast, drizzled with the sauce and garnished by fresh dill. The salmon looks SO good. I'd probably start out with a side of frozen salmon as I don't believe, unless you have a commercial freezer that freezes very quickly, that you can get efficient quick freezing. It's similar to what is recommended for raw fish used for sushi at home. Agree. In Moscow it's better to start with frozen salmon anyway. Fresh salmon is hardly ever available and most of what is offered as fresh is just defrosted. I guess this might be the case in many cities far from the sea.